08:30. Despite last nights Dig'99 Dinner the site is back to normal working and the JCB has arrived. 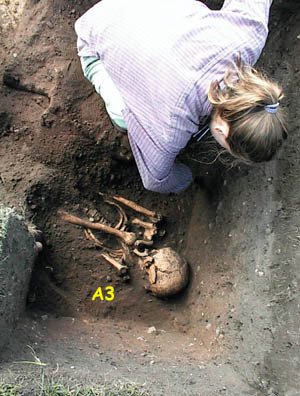 trenches will be filled (without removing skeletons) and the ground will be re-instated. 09:30 Everyone is hard at work. There is actually a lot to do on this final day of Dig'99. Here are some final pictures of Trench A and the extension. Looking northwards into Trenches AX & A. It can be seen that there are still at least six skeletons in the extension trench - CX1 was removed last night. They follow the same pattern as we have seen earlier in that they are laid west to east with the heads to the west. Only the skull of CX2 is visible, the rest of the skeleton seems to be within the east wall of the trench. 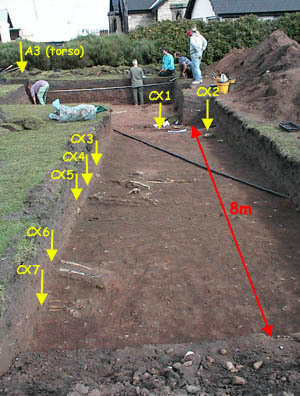 On the basis of this picture, it would seem that any boundary to the cemetery is further south than the 8m which the extension extends from Trench A. In Trench A Jo can be seen still working hard to expose the torso of skeleton A3 which is to be removed. The rest of the team in Trench A are are receiving instructions from Jim concerning the recording which still needs to be completed. Left: Jo working on skeleton A3. This skeleton will be exhumed and taken to the laboratory for closer examination. Right: Ivan and Trevor working at the south end of the extension trench. 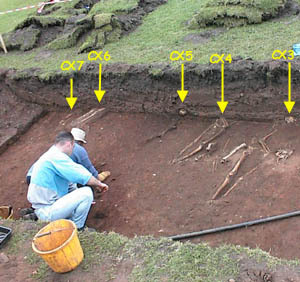 All of these skeletons will be re-buried in situ by the end of today. 15:30. And finally, the JCB reinstates the land where the trenches were cut. It won't be too long before it becomes difficult to see where the trenches were. Final images of Dig'99. 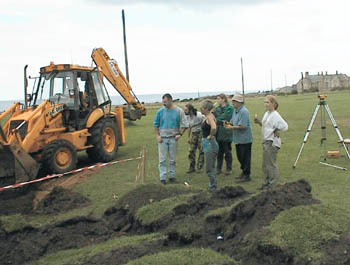 Left: Some of the team look on with regret as the extension trench is re-filled. Left to right: Ivan, Jamie, Liz, Katy (eating), Trevor (lighting yet another cigarette) and Jessica (eating). 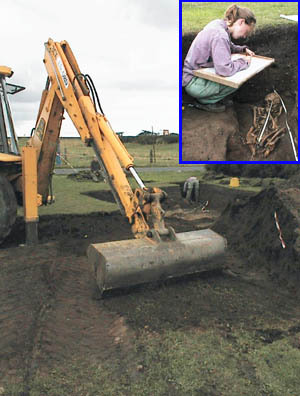 Right: As the re-filling progresses Jo (in the corner of the trench) refuses to stop work on skeleton A3. Dedication's what you need. Jo will be moving to Sheffield soon. We'd like to express our good wishes for her future. Good Luck Jo. For the Dig'99 Team the work has been completed. For the professional archaeologists there is much work to be done and many questions to be answered. The skeletons which have been removed will be examined in detail and then re-buried (elsewhere on the headland) with dignity. We will keep this web site live reporting any finds which the archaeologists reveal to us over the coming months. Meantime we'd like to start a debate about Dig'99. We will pass on your questions or comments to Naill and his team.